‘Stirling, Scotland’s Heart’ was an advertising campaign of 2012, but the idea has been current for much longer. In 1799, Gartincaber Tower was built by William Murdoch of Gartincaber House on a hill to the east of Doune to mark the centre of Scotland. There are different ways of calculating the centre of Scotland, but for many generations, Gartincaber Tower was believed to mark the true centre. The tower was built as a two storey gothic octagon with a parapet, possibly as part of a local employment scheme. This photograph from the Stirling Smith collections is by Stirling solicitor Thomas W. J. Leishman (1885 – 1965), taken when the building was still intact and before it received its wartime coat of paint in the 1940s. 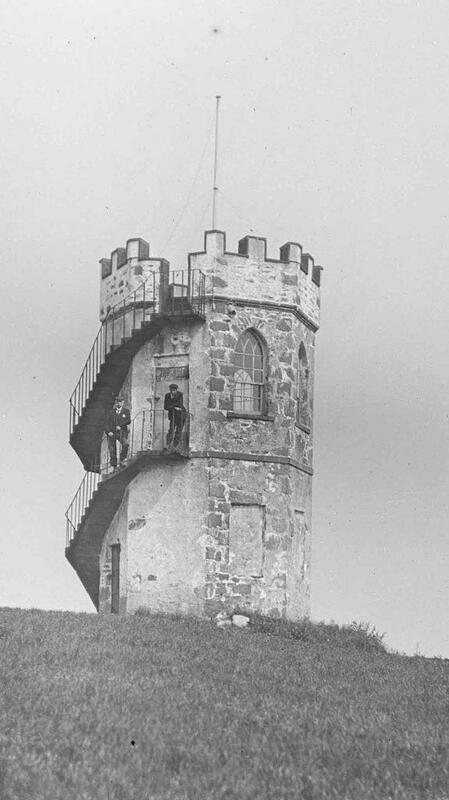 It was used as a lookout tower during World War II and continued to be used for military purposes until the 1960s. The two rooms in the building were reached by a cast iron stairway, and both had fireplaces. In 2005, a rescue attempt was made but in January 2012 the tower toppled in a fierce gale leaving nothing but rubble.